The FDA allows the importation of up to three months supply for personal use. A valid prescription is required to buy Belara online. 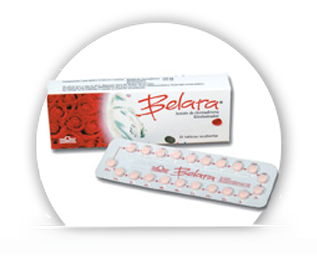 Belara® is an oral birth control that comes in the form of a tablet. There are two types of birth control pill. The mini-pill and the compbination pill. Belara® is known as a combination pill as it combines Estrogen and Progesterone components. It is made from a synthetic Estradiol (a type of Estrogen) called Ethinyl Estradiol and a Progestin called Chlormadinone Acetate (a synthetic form of progesterone). Belara is sold under various brand names like Balanca. Belara® is used primarily as birth control but it is also an excellent choice of medication for teenagers and older women with acne. Even if you are only taking Belara® as a form of birth control it can still have positive effects on your hair and skin. Belara® can also be used to help regulate irregular menstrual cycles, reduce heavy bleeding during menstruation and to reduce the pain and cramping associated with menstruation. It’s a very popular choice for birth control because of these added benefits. Belara® birth control medication should be taken once a day, every day. If you are new to Belara®, start taking it on the first day of your menstrual cycle. That means the day when your period begins. Take one tablet a day until the 21 tablets on the strip are finished and then have a 7 day break. Start the new strip after 7 days (so on day 8) and continue the cycle until you decide to stop taking Belara® for whatever reason. Ideally take the pill at the same time every day. It will help to remind you to take it and will reduce the chance of missing doses. Birth control is only 99% effective if you follow the instructions properly. Missing a dose can reduce the effectiveness of Belara® and can increase your chance of getting pregnant. If you do skip a dose then consult with your doctor or the Belara® instructions found in the packet. Being late for a dose or forgetting it altogether can result in pregnancy. Always keep a ready stock of Belara® in your medicine cabinet in case of missed doses or emergency. If you miss a dose of Belara®, take the missed dose immediately and the next dose as planned. Then continue the daily dosage schedule as like normal. If you only realize that you missed a dose when it comes to taking the next tablet then take two at the same time to make up for the missed dose. You can also do this if you miss two doses in a row, so you would take three tablets at the same time. If you miss more than three doses in a row then consult with your doctor and the packet insert. It might be better to throw away the pack and start the cycle again. Always use a supplementary birth control method like condoms, spermicides etc when you miss even one dose of birth control. Missing doses can leave you unprotected from unplanned pregnancies. Always consult with your doctor if you miss a dose, especially if it happens more than once in the same month. Taking multiple doses at the same time (making up for missed doses) can result on overdosing unknowingly. If you feel that you may have overdosed on Belara®, contact your doctor immediately. Belara® overdose symptoms include nausea, vomiting, extreme stomach pain and vaginal bleeding. Belara® birth control is generally well tolerated with little side effects. Most of the common side effects are the same as experienced when using other brands of birth control pills. They include stomach upsets, painful menstruation, changes in vaginal discharge, breast tenderness, irregular bleeding like spotting and breakthrough bleeding, headaches, dizziness, tiredness, mood swings, hair loss or extra hair growth. If you start experiencing depression, increased blood pressure, water retention or severe weight gain then let your doctor know. You might need to try a different birth control instead. Like all medications serious side effects can occur. For example, allergic reactions signified by numbness of the lips or tongue, rashes or hives, difficulty breathing etc. Changes to skin tone and pigmentation, libido, fungal infections, back pain, muscle problem, visual discomfort and changes to vision, high blood pressure, varicose veins, thrombosis or deafness require medical attention so book an urgent appointment with your doctor. Your dosage might need to be adjusted or you might have to stop taking Belara® and use a different brand of birth control instead. Using any birth control that contains Estrogen and Progesterone can lead to an increased risk of developing serious illnesses like cancer, tumors, inflammation of the bowls, vein or artery blockages. Do not use Belara if you are pregnant – it can harm you and the fetus. It should also not be used immediately following the birth of a baby. You should wait a few months before beginning the course of treatment. Avoid taking Belara if you suffer from blood pressure related problems or have suffered from cancer. Avoid taking Belara® if you have suffered from organ diseases especially disorders of the lung, liver or kidneys. Heart patients should avoid taking Belara® or any other medication other than their heart medication. Stroke victims should also avoid using Belara®. Women who suffer from migraines, are overweight or suffer from cholesterol related problems should also not take Belara®. Taking Belara® alongside other medications like antibiotics, vitamin tablets, hepatitis C medication, HIV / AIDS medication, may reduce the effectiveness of Belara® – make sure you discuss this with your doctor! Do not take Belara® if you have an under-active thyroid or history of depression. Likewise, Belara® should be avoided if you are Diabetic as it may affect the blood sugar levels in the body. Do not take Belara® if you suffer from seizures or epilepsy or have suffered from tuberculosis in the past, blood clotting or are sensitive to any of the ingredients of Belara®. You should stop taking Belara® before going in for any surgery. Belara® does not protect against sexually transmitted diseases. Belara® may interact with over the counter medications like vitamins, minerals and herbal products. It’s best to avoid new medicinal drugs when you are on Belara®. Belara® can specifically interact with medications such as barbiturates, Phenylbutazone, Rifampicin, Phyenytoin, Primidone and some other Anti Epileptics. This means that the combination of drugs might lead to Belara® not working as effectively as it should do even though you don’t miss doses and take it according to the instructions. Belara® can affect women suffering from Diabetes as it alters the insulin levels. Belara® can also react with Anti-Hypertensive drugs. Taking St John’s Wart alongside Belara® can cause spotting in some women. The information about Belara® on this site is purely educational; it does not replace a doctor’s consultation. At buy-birth-control.com you can buy birth control online at better prices. Our mission is to give you affordable birth control and menopause meds so you can take care of your menstrual health and know that you're getting the best deal. Our online birth control and menopause medications are dispensed by reputable pharmacists and shipped all over the world. We're happy to answer your questions. Take advantage of our excellent and personal customer service. Receive personal and immediate responses to your questions from our resident pharmacist. Trademarks and registered marks are the properties of their respective companies. Copyright © 2015 I-L-S Ltd. All Rights Reserved. Compare prices on birth control products with this price compariosn chart.